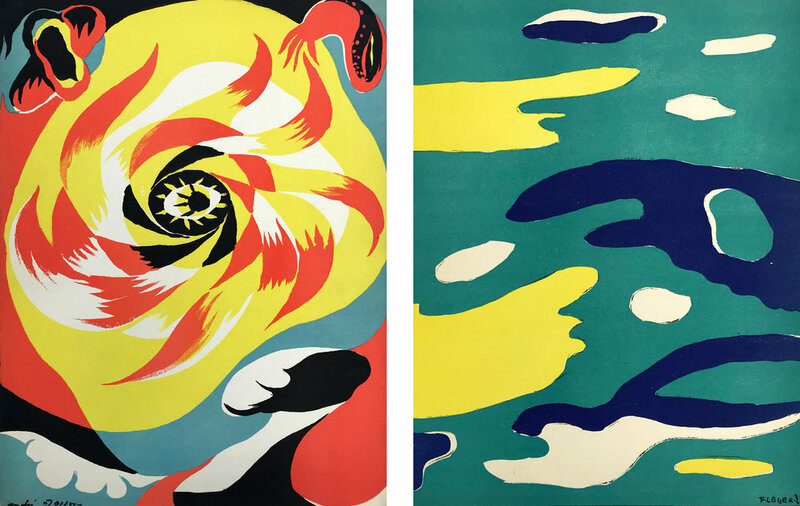 Between 1937 and 1960, art critic Tériade commissioned some of the most prominent figures of the Modern art scene to produce lithographs for his luxury art journal Verve. The publication sought to share the ideas and techniques of new French art with an upcoming generation of painters and intellectuals, presenting the work of artists like Miró, Matisse and Braque to a much wider audience. Their images were accompanied by texts written by Ernest Hemingway, James Joyce and Jean-Paul Sartre, to name a few, resulting in a unique and enduring celebration of art, literature and critical thinking by some of the 20th century’s most important creatives. By the time Verve was conceived, Tériade had gained a wealth of experience in both publishing and the art world, writing and editing a number of important art journals around Paris. Owing to the high degree of complexity and design work, only 38 issues of Verve were ever published. Each one was richly illustrated with original prints editioned at the renowned Atelier Fernand Mourlot, where Picasso, Toulouse-Lautrec and many others also produced work. This exhibition presents a selection of these rare lithographs from the first six issues, published between 1937 and 1939. Coinciding with the Great Exhibition of The North, this show highlights the wealth of visual culture in the North East, and demonstrates the region’s engagement with the outside world.